My husband and I bought our cute, little 748 sq. ft. dream house at the peak of the housing market, only to find ourselves underwater a couple of years later. We would have gladly gone house hunting as our family multiplied, but there was nothing we could do. So along with learning valuable lessons from living in a 2 bedroom house with 5 small children ; I have also started to see the benefits of small house living. Of course there are definite cons to living in a small house and I look forward to the day when God provides us with a bigger one for our expanding family. More space would be warmly welcomed! But I can truly say that God has brought me to such a place of contentment with the sweet little abode he has given us. It has not been an easy adjustment for me but each day God is giving me eyes to see all the benefits. When you have little ones, keeping your eyes on them is a priority. Silence and not being able to see what they are up to is never good. Mine still find a way to get into things but it helps that I can get to them pretty quickly. I love being able with the simple turn of my head see the boys hard at work in the school room, Simeon dumping out all the blocks in the kids room, Luke climbing up on the kitchen table and Ellie reading in the living room. I have always had an emotional attachment to things that I have owned forever. I basically keep things because...I have always had them. As I have had to downsize, I have found myself detaching myself from the things that are taking up space and that I really don't use. I am always amazed when I periodically clean out our closets how much I am able to get rid of every time. I am a sucker for a bargain. If it's cheap I'll buy it for the main reason...that it is cheap. You know what? Most all the things I have gotten rid of are those purchases that I have gotten on clearance. Less space has made me become a more cautious and realistic consumer. Don't get me wrong; I still love me a good garage sale and some thrift store shopping, but I am very careful not to buy something just because it's cheap but because I need it and I love it. Now before I say anything else, I just want to clarify that some days I feel like all. I. do. is. clean. But I can safely blame this on my 2, 3, and 5 year old mostly; who have a habit of dumping e.v.e.r.y.t.h.i.n.g. and anything on the floor and not moving a finger to help clean up. (We are working on it) I will always have messes to clean up but general cleaning i.e. sweeping, mopping, dusting, and regular daily cleaning of kitchen and bathroom can be done fairly quickly. My family is very good at messing up our house with world record speeds but the clean up generally does not take that long... comparatively; depending on what level of messiness it is in. Not all, but most evenings after the kids have gone to bed I will do a quick clean up. I can get so much more done when they are not running around and it just feels SO good to have the house stay clean for a whole 8 hours; even if everyone is sleeping. Granted we could definitely use another bathroom, but It doesn't take me longer than 10 minutes tops to give it a good cleaning. I can sweep and mop the whole house under 20 minutes. Dusting the whole house from top to bottom takes quite a bit longer but I try to focus on the living room and save the deep cleaning for a couple for times a year. One thing I have noticed is that I tend to tidy up more, since a few things scattered around the living room can make it feel like it's a huge mess. So I tend to keep what is in the living room to a minimal. More things just make it look cluttered and chaotic. Again, smaller living quarters have made me reevaluate what I really need in our living space. There are many days I wish I could escape and have place to hide from the somewhat chaos of my wild bunch. But most days that means I literally need to get out of the house. Quiet and calm is not to be commonly found in our home. Since I need time to myself, I have prioritized getting out to exercise, spend time with the Lord and fellowship with friends. Every time I get out, I am ready to get back to my brood welcoming me back with shouts of, "Mommy's home!!" When you are in such close quarters with your loved ones, they can easily get on your nerves and dare I say...drive you crazy. I have come to terms with facing the fact that no amount of spacious living can alter my family and I's sinful genes...though it might help a little. We have been stretched and challenged to fight through the difficulties for peace and learn to humble ourselves and work through what the real heart matter is...only making us a stronger a closer family. Not only has living in a small house caused us to come together closer in our relationships but it has literally brought us physically closer. When we all huddle up for a family movie night. We all take up the couch and loveseat. We have to squeeze together to each get a space. I have to say my favorite time of the day is when we are all snuggled up on the couch just relaxing and spending time together. Josh and I usually have at least one kid in our laps. It's the best. And of course when they all fall asleep is even better. Living in a small house is not always easy but when we are focused on what is really important...we can easily see all the benefits. Whether you live in a small house or a house that is not your dream house, I want to encourage you today to look at all the benefits of living where you are. As you have heard, the grass is always greener on the other side. I look forward to the day when my family and I will be able to either add on to our home or move to a bigger house. But right now this is our home. It's more than just walls and space... it's where we do life. I truly love our little home, not because of how big or how small it is, but because of who I share it with. 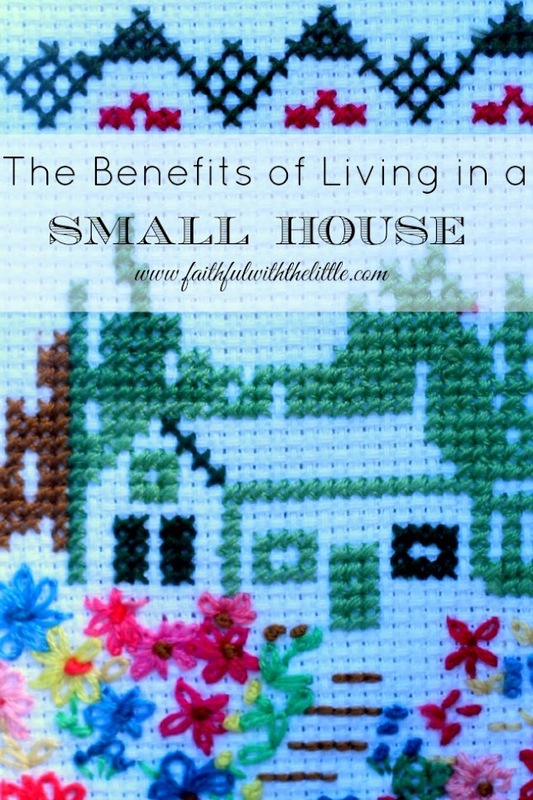 Do you live in a small or imperfect house? What are the challenges you face in your living space? What are the benefits you have found? Love this- we have loved our small house so much. There are so many blessings that come from it. Thanks for linking up today! Yes, I am thankful that God has taught me to see them! Amen to having less to clean! Here in Uganda we have all been sleeping in the same room (my husband and I , two little girls, and one foster baby) as we use the other room as a school room. I love all the benefits you listed. Thanks for linking up! Wow, 1 room that really is small house living! You guys are troopers! It's amazing how you can see the benefits when God gives you the right perspective! Great post! I always thought my dream home would be a lot larger than our current 1400 square feet home, but after living here for 3 years I wouldn't have it any other way! I totally agree about the time it takes to clean...there's no way I could handle cleaning a larger house! I know that if God ever moves us to a bigger place I will definitely miss having less space to clean! Yes, I sure appreciate my older boys who pull their weight around here! We live in a 1200 sq. ft. home. The longer we have lived in it, the bigger it feels because we have learned how to make it work! I can totally relate to your list. I also love that we save money on heating and cooling. Totally! I have learned so much! I am going to have to add saving money to my list! Thank you for sharing the blessings that you experience living in a small house. Our house isn't necessarily small, but it feels that way with two families living it. My son-in-law, daughter and precious grandbaby, their german shepherd and of course my husband and myself are all living together for a season. A season that I am cherishing with every passing minute as I believe it is drawing to a close soon as my daughter and son-in-law begin the house purchasing journey. They haven't been pre-approved for much and will probably end up in a small house. I will be sure to bookmark this blog post to save for my daughter to read to encourage her that no matter what borders the Lord establishes for her and her little family, there will be many blessings. God has a purpose for everything! I am so thankful for all that God has taught me through small house living, though I kicked against it at times. Praying God leads your daughter and son-in-law to the right house! So true Jes! I am SO thankful for all the blessings God has shown me that I have in him, despite circumstances and places! 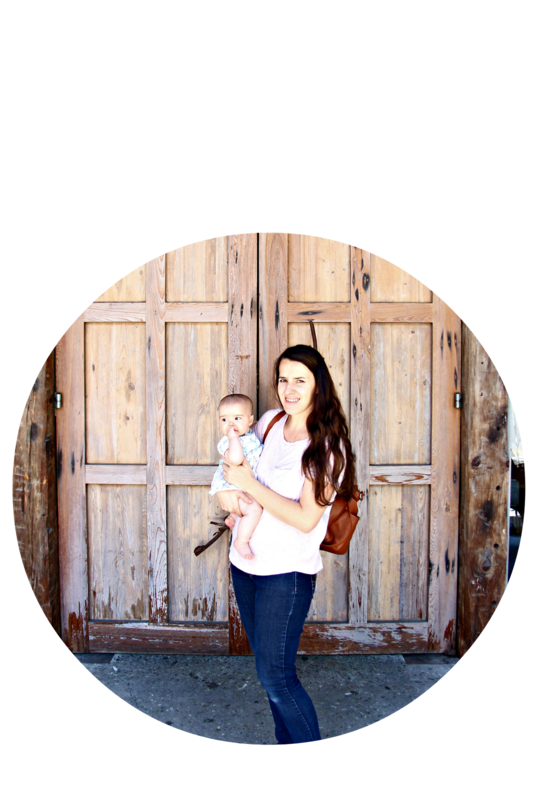 This is a lovely and very encouraging post, Rebekah! We have never had a very large house, so I can really relate to your thoughts and insights. Sometimes our house seems about to burst with the seven of us here all day (my husband works from home), but it has really motivated me to constantly be decluttering and only keep what is absolutely necessary. Thanks so much for sharing at Artful Homemaking! I love bing in a small house. It's better for the budget, especially with winter coming!